With only four ingredients, this delicious and simple salad is ideal for a throw-together mid-week dinner. I always make plenty so I have leftovers for lunch! You bet this is also a really healthy salad. 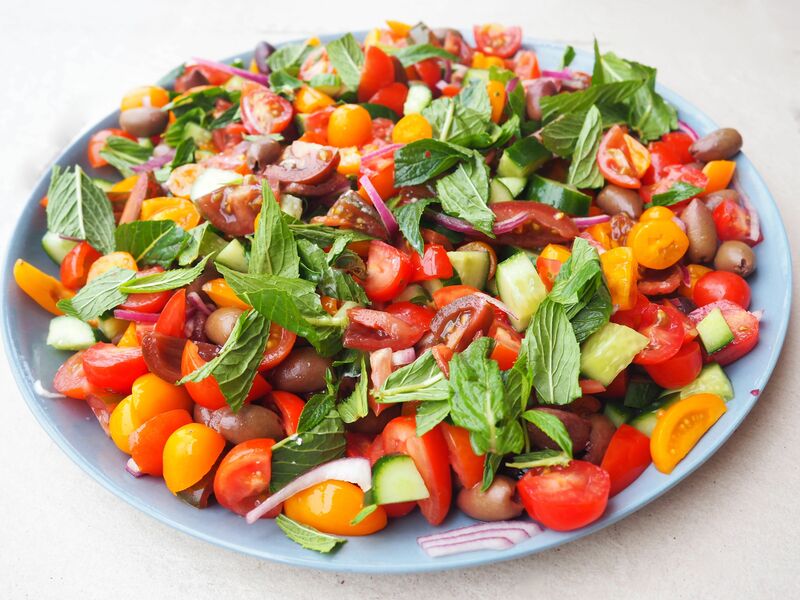 The best thing about this Mediterranean salad is it's so perfect for entertaining. It's not only beautiful, but it suits many diets and preferences. It's ideal if you need to make a salad that's; wheat and gluten-free, nut-free lactose and dairy free, parev, paleo, ketogenic, vegan or vegetarian... and the list goes on. Cut out the onion (or swap it for chives) to make it more FODMAP friendly. Dressing: You can pair this Mediterranean salad with a beautiful homemade salad dressing but I love to keep it simple with a lug of extra virgin olive oil and balsamic vinegar or fresh lemon juice. I like to get heirloom or medley tomatoes for this recipe because it's pretty but you can also just buy usual tomatoes. Will still be beautiful and good for you. This salad loves you back: Tomatoes are loaded with something called Lycopene (which is actually what makes tomatoes red)! Lycopene has been shown to help protect skin from sun damage and reduce the risk of heart disease and cancers (particularly prostate, stomach and lung). If heart disease or those type of cancers run in your family, this kind of salad is especially great for you. I love leafy greens but I gravitate toward tomatoes (and other red veg) which is a major ingredient in the world healthiest Mediterranean diet. Eat up, buttercup! You can also add a big wedge of feta or a tin of chickpeas. Swap mint for basil or parsley if you want. NEED HEALTH INSPIRATION AND IDEAS? Enjoy these blog posts.